If you’re looking for a rugged, heavy-duty piece of machinery that you can trust, look no further than Bobcat genuine parts and products. Bobcat has been a leader in the industry for more than five decades, providing machinery, attachments, and services whose quality simply cannot be touched by the competition. Reliability, resilience, trust, and performance are all names synonymous with Bobcat, and they have worked hard over the last 50 years to secure their position as the most innovative industrial brand in the world. Don’t let your ground tell you where you can dig. 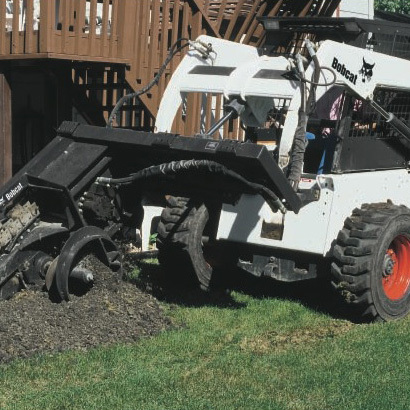 You can dig through any condition with the super tough Bobcat trencher. This heavy-duty powerhouse is designed to dig right through the toughest and rockiest conditions with ease and strength that is unsurpassed, allowing you to get any work done anywhere you need to do it. Depending on the Bobcat model you use, you have the option of choosing either hydraulic or manual side shifting with your trencher attachment. You can also change the chain and teeth types on the trencher. All of these added features maximize the capabilities of the trencher, allowing you to dig in a number of different locations through any type of soil. Whether you have to dig a trench for an irrigation system in the middle of a field or to lay down lines in close proximity to buildings or other obstructions, there’s a Bobcat trencher model built specially for your particular job. Choose from four different models, spanning light jobs to heavy-duty jobs, and enjoy the added features that come with each Bobcat trencher attachment. A large diameter auger, narrow frame width, and reverse rotation are just a few of the added features you get to enjoy with these genuine Bobcat attachments. Get digging with the assurance that Bobcat is working by your side. This versatile tool can be used for a variety of jobs ranging from light to high-production trenching. Digging depths range from 60cm to 150cm. Manual or hydraulic side shift lets you get close to walls.